This is a exclusive formula that mixes natural ingredients to achieve a unique cream that gently hydrates and soften your skin. Perfect for dry skin. Is a unique combination of flax seed and aloe vera that gives the hydration and softeness that all women dream with. This cream contain Omega 3 and 6 the rejuvenates your body. It is not greasy. 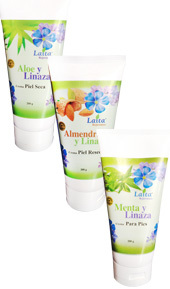 This a wonderful creamy lotions made with mint extracts and flax seed the refreshes and soften your feet. Besides to the natural hydration it soften the hard skin (callosities). Not greasy.